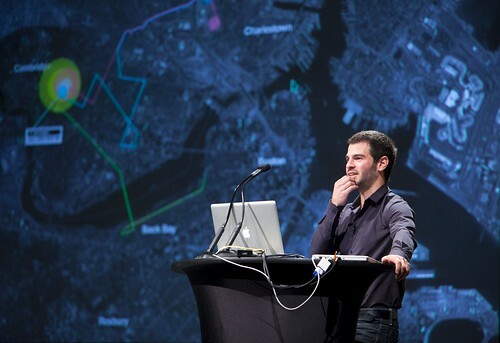 Assaf Biderman, who runs the SENSEable City Laboratory at MIT, opened with reminding us that people used to think virtual connectivity was going to reduce urban density. This proved not to be true: the Internet did not introduce the death of the city. Cities are instead a concentrated focal point of looking at new ways to be sustainable. 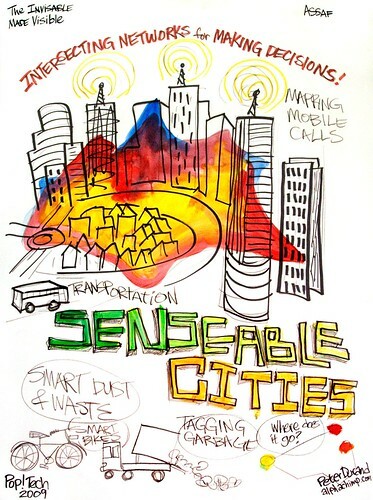 The SENSEable City Laboratory partners with cities around the world to develop test case implementations. Biderman showed a few examples of their work in action. In Rome, they tracked cell phone activity during a soccer game. This creates an emotional map of what’s happening in a city. They also mapped bus routes and overlaid it, providing two real-time data sets. By examining patterns in this data, different types of land use can be planned. The New York Talk Exchange project studied communications traffic with the city of New York and the rest of the world. The data already exists to track the use of land lines in and out. Data in cities is ubiquitous. Finally, the Trash|Track project, done in partnership with Waste Management, looks at the “removal-chain”. Supply chain has become increasingly efficient (and well-documented), but waste managment is not. Wanting to track the reverse of a supply chain, the invited members of the Seattle community to tag their garbage and the researchers than tracked its movement. Different materials are being used to tags different types of trash (foam vs. rubber). They created a “wedding wish list” of trash to create a truly representative picture of average household waste. Everything from teddy bears to tires was tagged. Currently have ~2,000 objects tagged and expect to tag another 1,000. The early results are now on display as a show at the Seattle Public Library. An awareness of where your garbage actually ends up could have great impact on changing behavior. With this type of data, there’s also the possibility of improving infrastructure (and other services like cell phone usage and bus routes).